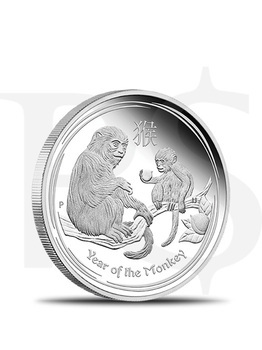 These 2016 Perth Mint Lunar Series II Year of the Monkey coins contain 1 troy ounce of .999 fine silver each coin weighs 31.135g, has a diameter of 45.60mm in brilliant uncirculated condition. With a mintage limited to 300,000 pieces, these coins epitomizes the Perth Mint's rich tradition of minting bullion coins portraying Chinese Lunar themes and have proven be be highly sought-after and collectible. The reverse design of this year's release marks the 2016 Year of the Monkey, one of the 12 animals associated with the ancient Chinese lunar calendar and the "ninth" coin in this series. Each coin depicts an adult monkey and a baby monkey sitting in a peach tree. The baby is holding a peach, which is symbolic of longevity and immortality. Those born under the influence of this sign are said to be intelligent, quick-witted, optimistic, ambitious, and adventurous. The Chinese character for ‘monkey’ and the inscription ‘Year of the Monkey’ also appear in the design with The Perth Mint’s traditional ‘P’ mintmark. 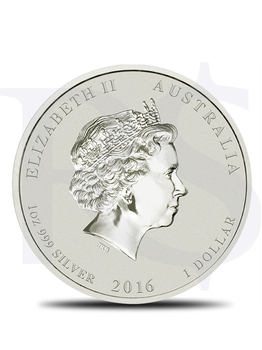 The Ian Rank-Broadley effigy of Her Majesty Queen Elizabeth II, the 2016 year-date, and the monetary denomination are shown on the coin’s obverse.